Entities have been in Drupal since 7, but in Drupal 8 they've become the de facto ORM, for storing and manipulating data "lumps", where each lump is identifiable and separate from the others (although it might reference them), and can have some complexity of internal structure. A particular blogpost, or news item, is an entity; each user is an entity; each file uploaded to Drupal becomes both the raw uploaded file (e.g. a PDF) and also an entity in the database. Entities allow metadata to be recorded about non-entity resources external to the database, like files, and also give a lifecycle to both the data and any external resources: the data can be retrieved later, updated and ultimately deleted. Why did Drupal invent its own ORM, rather than using something like Doctrine? After all, Drupal already uses Doctrine's annotations, as we've seen previously, and Doctrine invented these specifically to provide metadata to (m)ap between PHP (o)bjects and a (r)elational database (hence ORM.) Well, this highlights the key difference between Drupal entities and objects: in traditional ORMs, an object declared in code has a hardwired set of properties, which map to columns in the database; in Drupal, entities of a given type can have both a shared, hardwired set of fields, but also a configurable set of fields, and even subsets of fields configured through bundles. In addition, entities can have a kind of fundamental type, meaning they can either be storing configuration data, or content data. 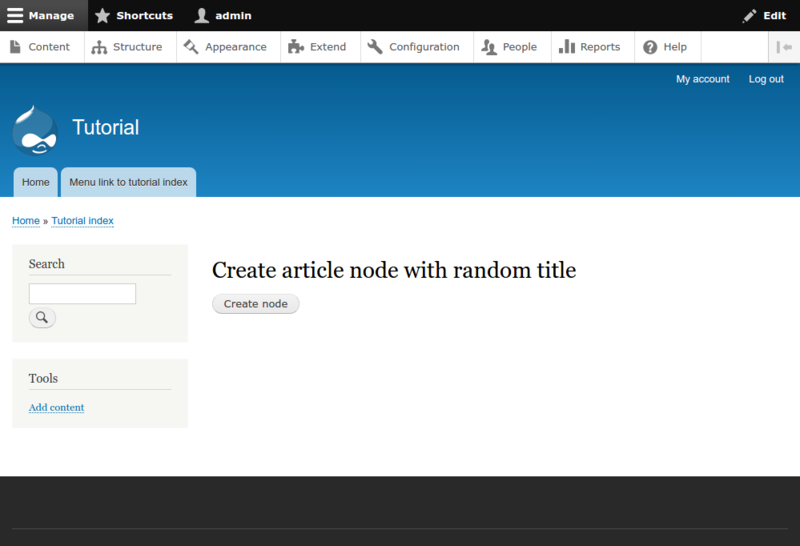 A blogpost is a content node entity of bundle blogpost, with base fields title, author, created datetime etc. 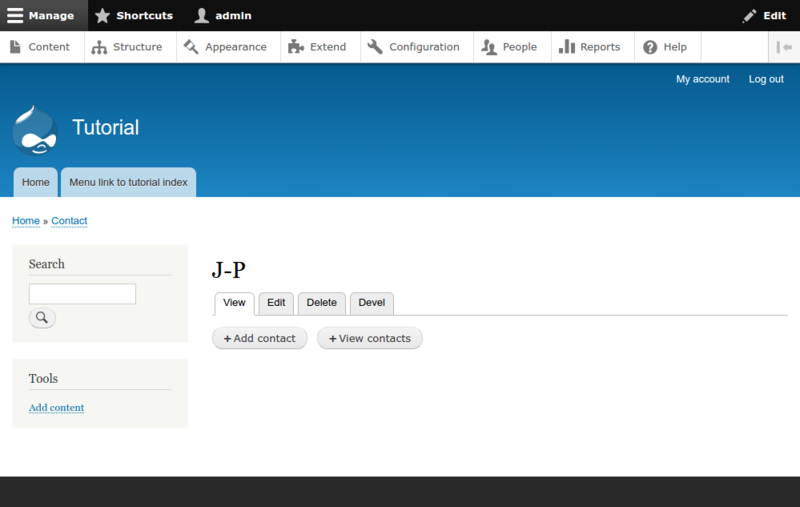 and configured fields body and related tags. A news item is a content node entity of bundle news item, with base fields title, author, created datetime etc. and configured fields body, related news items, related files. A tag is a content taxonomy entity of bundle tags, with base fields name, description, parent term etc. 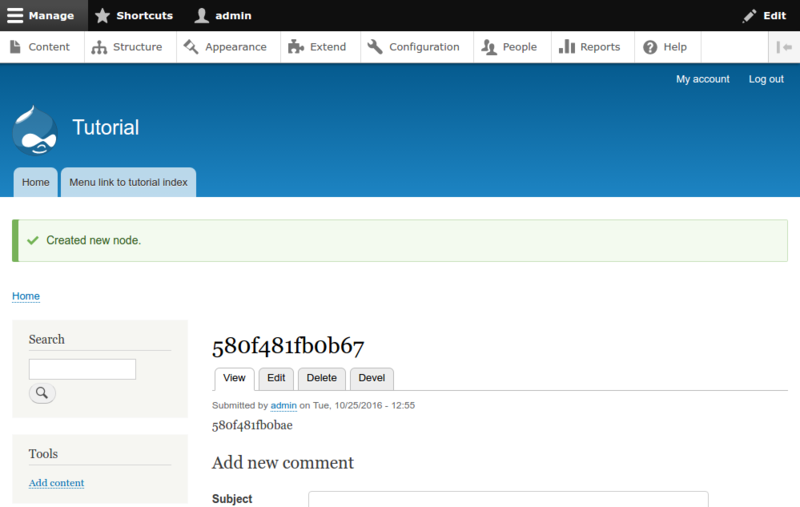 and configured fields related tag. A user is a content user entity of bundle user, with base fields name, email address etc. and configured fields first name and last name. A block is a config entity, with arbitrary data. A block's content is a content block-content entity, with base fields name, email address etc. but not usually any configured fields. A field's configuration is a config entity, with arbitrary data including associated entity type and bundle. A view is a config entity, with arbitrary settings but as a minimum ID, label and other defined values. A contact settings is a config object, with arbitrary settings but including flood limiting and whether the personal contact form is enabled. This is by no means an exhaustive list (as we'll see below, anyone can create a new entity type) but gives you some idea of what different subtypings mean. Note from the above that config objects entities are not fieldable and have no bundles: they just store (effectively, but not quite) arbitrary structured data; we'll explain in a later tutorial how that's different from fields. In addition, users are fieldable "content" entities, but they only have one bundle, "user". A user's profile, on the other hand, can have different bundles. Obtain the entity manager, as a service, through dependency injection (previously discussed). Obtain (from the entity manager) the storage manager for content entities of type "node". Tell the "node" storage to perform tasks relating to nodes: creating (for later saving); retrieval by ID; discovery of many nodes by query. Note that creating and saving are two separate tasks: the storage creates a node object, and then the object can be told to "save itself". Note also that entity queries can be instantiated via manager-service-via-storage, but can also be created by a query factory service. If you only need to e.g. find an entity ID based on certain conditions, you could inject the factory service into your code instead. * Form: create a random node. *   Entity manager to create and save nodes. // We'll use this storage potentially several times in the loop below. // Get a list of the most recent node IDs, and generate links to them. // Load a node for each ID returned from the query, and generate its link. // Add markup with links to the top of the form. // Some entity types refer to "bundles" differently: nodes call them "types". // Data for the node. // Body CAN be just a string, but this way we specify body format too. // Create the node from the data array, save it and redirect to it. In the buildForm() above, we make an entity query, which permits us to attach conditions on what entity IDs to return: but only ever returns entityIDs. We must then use the entity manager to load each entity in turn, so we can ask the entity for a HTML link to itself. Later, in the submitForm, we use the same entity manager to create a new node object using structured data populated with random text. The resulting object must be explicitly saved, for it to persist in the data store. Finally, we ask the node for a link to itself. Each entity type (node, user etc.) has routes named by convention, as we'll see below. That means that asking a node for its "canonical" route here (a term we'll discuss below in the context of a custom entity type) means we don't have to ask the routing for the "entity.node.canonical" route, then replace wildcards with the node ID etc. This form-based routing has been discussed previously and so should be familiar. The only new key is the _node_add_access in requirements, which should be self-explanatory. 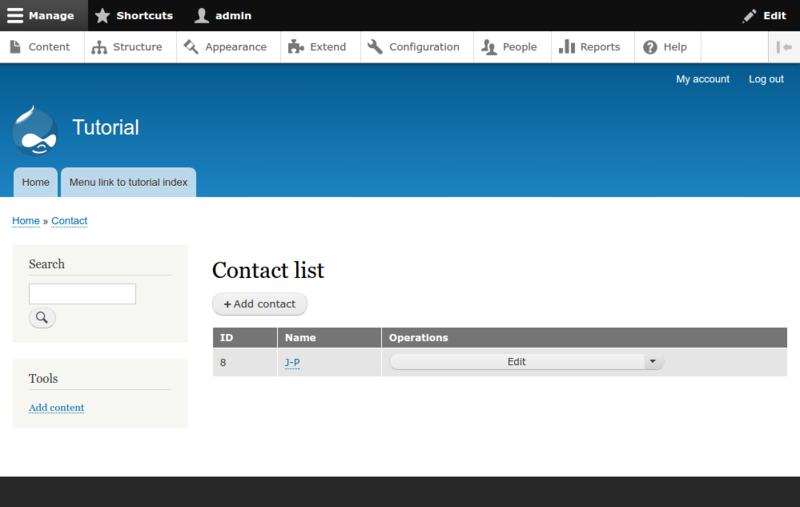 Routing and navigation permits access to (almost all existing) controllers which manage and list the entities. Some controllers must be extended to suit entities of the custom type. New permissions prevent unauthorized users from accessing those controllers. Let's consider a new content entity type: contacts. For example, your website might want lightweight (i.e. non-node) entities to permit several pages to list a particular contact point: for example, when many pages need to have a link to your HR department, or to a particular person on a particular team. In future, when we discuss the field API, we'll define a difference between organizations and people using bundles, so they can have different fields on them; for now, let's treat all contact entities as having the same fields. * Defines the Contact content entity. The @ContentEntityType() annotation in the comment. 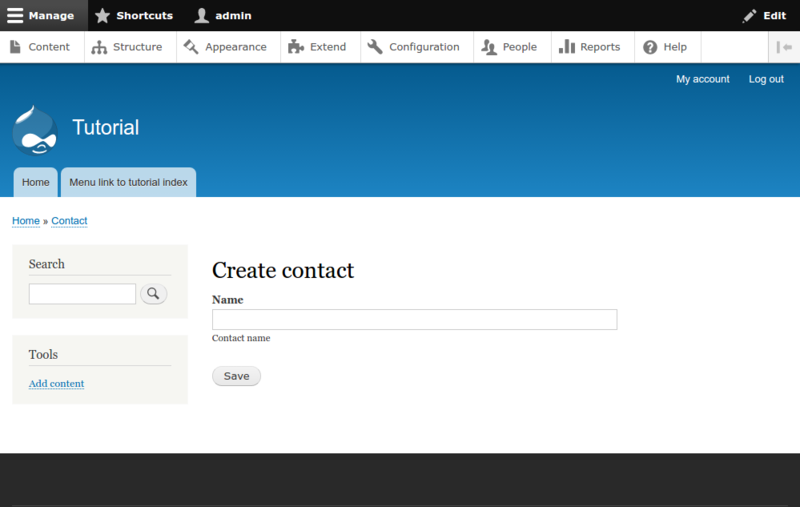 The baseFieldDefinitions() method, defining fields common to all contact entities. These properties should be self-evident. Avoid changing the latter pair once you've got the entity set up: they determine structure in the database. We'll define permissions below for the granular "CRUD" actions one might perform against an entity, but in the annotation we can also designate an "override" permission, to permit full administration of contact entities, which can be either an existing permission or one we define. The keys of core entity properties as they're stored in PHP, matched to how they're stored in the database. These core properties aren't usually translatable, and are often read-only (or at any rate write-once) like ID, UUID and (as we'll see in a later tutorial) relevant bundle. We'll expose label (the odd one out) as a fieldable, editable property in the PHP code below. Although we provide routing below, it's difficult for Drupal to work out e.g. the "edit" or "view all" link for a given entity, back from the routing which could be provided anywhere. As a shortcut, the essential links for "what can I do with this current entity?" should be listed here. A "canonical" link is a kind of "default" link for the entity: if in doubt, use this one. Taken as a whole, the annotation looks complicated; it breaks down fairly easily into the above chunks, though. We'll add a bit more to it in a later post, when we discuss fields and introduce bundles. The fundamental properties of the entity, defined in the entity_keys part of the annotation, need to be made into base fields so that they can both be available in the entity edit form and (where appropriate) viewable on the entity view page. You can see in the code that we first call the parent method, which is generally good practice. Afterwards, we configure three base fields: one for each of the entity properties. Finally, we mark two of these base fields as read-only (these are the ID fields which should never change) and give the third some clearer instructions on what "type" of data it is. As we'll see later when we discuss fields in more detail, the big difference between the simple data value and an actual field is this collection of metadata about how the field should be stored, edited and displayed. Once we have the basic type class set up above, we need to define a few entity permissions, and provide a custom class to manage access through those very permissions. This provides titles and descriptions for the permissions UI, keyed by a potentially shorter text string which serves as a "machine name" (discussed previously). This machine name is what we reference e.g. in the @ContentEntityType(admin_permission = "...") annotation above. * Control access to a contact. This is a very simple class which negotiates access requests for certain entity actions, and responds accordingly. For view, edit and delete we straightforwardly return the permission. However, because our create permission is actually called add contact entity, we need to stub out the checkCreateAccess() method to map that separately. Here we have added routes for the four CRUD actions, plus a "collection" or listing route. There are new parameters, not discussed in routing before, like _entity_form and _entity_access: these are hopefully self-explanatory, and lets the routing system reference the controllers and forms defined already in the annotation rather than hardwiring the same classes twice. 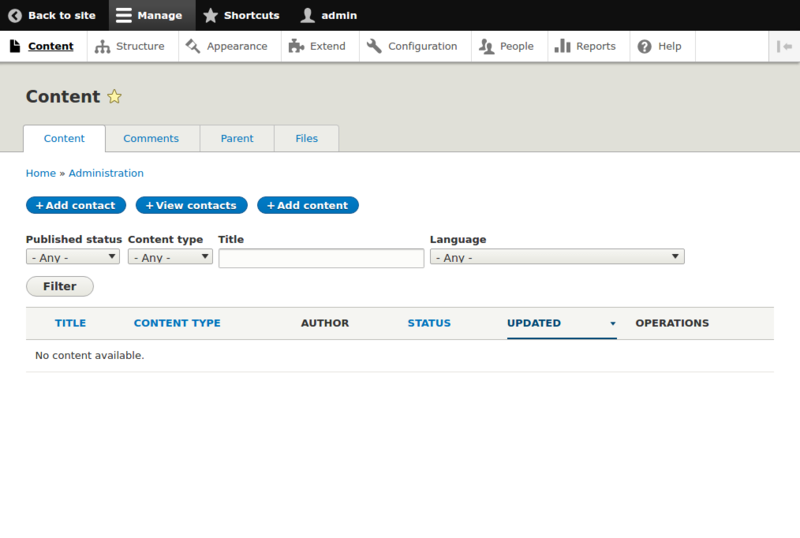 This adds action "shortcuts" on the admin/content page, and between the canonical and collection routes for contact entities. This adds a tab group of view/edit/delete for a given contact entity, permitting quick navigation between all three routes. * Controller: list of contact entity. * Form controller: add/edit form for contacts. // Save the entity, so it has an ID. // Redirect to the entity's own page. This one method redirects to the entity's canonical (i.e. view) route, when the entity form is saved. Otherwise, the form does not redirect. As previously discussed, you should have Drush installed, and always clear caches when registering new configuration like services, routes etc. 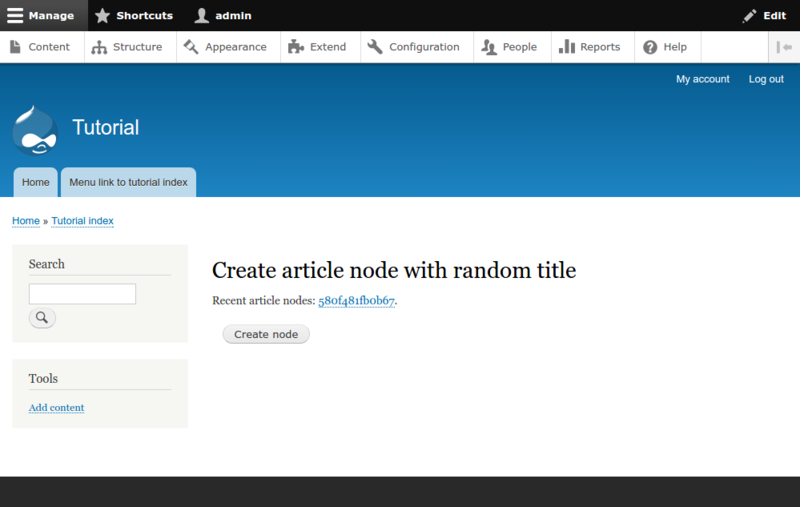 You should see that the title of that most recently created node is also present now, above the "Create node" button. You can see that the view copes quite happily with zero items in it: the boilerplate text here is provided by Drupal core based on the label in the class annotation ("Contact entity"). The contact's name is defined in the entity_keys as the entity's label, and is therefore used as the title of the entity's own page (in this case, "J-P"). If you can see all of the above, the congratulations! you have manipulated node content entities, and created entities of your own entirely custom entity type.